The ubiquitous lechon, quintessential fiesta fare, has a wonderfully crisp skin. 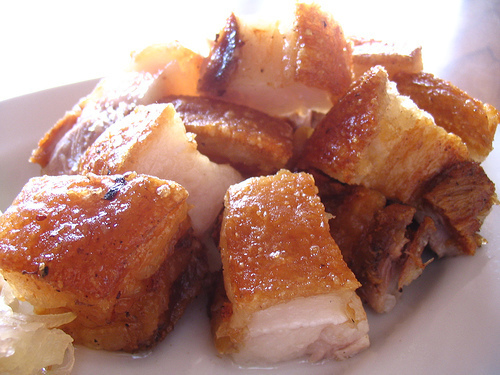 Lechon Kawali is one of the most popular pork dish in the Philippines. It is a pork belly boiled in water with spices, drained then deep fried until crisp and golden brown. For me, best dip sauce is a mixture of soy sauce, vinegar, onions and red hot chili. 2 Slice the pork belly or pork ribs into 4 pieces, about 3/4 in (2 cm) thick. Season the meat with the garlic, salt and pepper. 3 Boil the seasoned meat in the water in a large pot until tender, about 1 hour. Drain on a wire rack and allow to stand for another hour. 5 Then slice the meat and serve with a small bowl of the Liver Sauce on the side.